Shopping is definitely not a man’s game. For one, most of them don’t have the meticulousness of a woman when it comes to purchasing items. Two, most of them just don’t have the woman’s shopping instincts or patience. But shopping needs not be complicated for men, especially when they are guided by the right questions. Setting a budget is like setting the boundaries of a basketball court. This way, you’ll know how far you can dribble your money for an engagement ring. If you’re unsure of your price range, a 1940’s ad suggested a budget that is equal to two months of your salary. But if you’re uncomfortable spending that much, you can definitely lower it to your convenient price range. However, if you have enough savings to spend on an expensive ring, then invest on it. Remember that wedding rings hold symbolic and lifetime values. But this should not cause you to jeopardize your financial stability. Determining a price range that you’re comfortable with will make this shopping experience more rewarding. Once you’ve determined your budget, it would be easier to explore available options that could maximize your hard-earned money. Where should you buy the ring? Is the company established and has credentials? Do they offer a wide variety of services? Do they handle diamond certification and appraisal? Does the jeweller listen to your needs? Basically, you have to ask yourself if the jewellery shop could be trusted. Checking their valid third-party certifications and verifications will further help you ensure their authenticity. Asking the right questions and having a sense of trust with the jeweller will make your shopping experience more convenient. You can also seek the advice of you friends, family or any trusted person. Better yet, bring them with you when scouting for an engagement ring. If the ring still doesn’t fit, you need not be anxious. Take the ring back to the jeweller and have it resized (though you may have to pay extra for this). Nevertheless, the best and easiest way to know her ring size is by asking her directly. Every woman is unique. Thus, it is imperative to research the style of your partner to determine the perfect ring design that will best reflect her personality. Important factors to consider when choosing a particular style are setting, stone shape and cutting style. Gentle. If your girlfriend reflects this personality, e.g., she loves animals, children, and elderly people and has really long patience, a simple yet elegant design might be the perfect ring for her. Artsy. If you’ve fallen in love with a woman who is passionate for arts, theatre, literature, and music, choosing a uniquely designed ring may suit her perfectly. The ring needs not be huge or expensive. But it should be interesting enough to capture her imagination. Bold. If your girlfriend is the type of woman who speaks her mind and enjoys being the center of everyone’s attention, then you should probably choose a ring that will reflect her outstanding personality. Choosing larger settings and stones, like sapphires and rubies, usually captures their attention. Classic. If your partner usually dons on a classy little black dress or a white blouse or a high fashion bag, chances are she’s a classic woman. Choosing a simple yet elegant design (e.g., a sparkling round cut diamond) will do you just fine. Remember that these women choose substance over trends. Fashion-forward. If your girlfriend is the type who goes with the most current fashion trend, choosing a modern yet sophisticated design may be your best option. Dramatic. For men with passionate and fiery partners, choosing a flashy but elegant design will bring smiles to your bride-to-be’s face. You may choose resplendent stones such as a princess cut diamond. Eclectic. Bubbly and energetic women have a unique style of their own. If your girlfriend is this type of woman, choosing a unique design that would appeal to her many distinct styles will surely impress her. You may go for a vintage design with a romantic touch. Whatever style you choose, remember that nothing touches a woman’s heart more than a thoughtful man. Should you go for a diamond? Pro: A diamond ring is the quintessential symbol of purity and elegance. Plus, the circular shape of the ring is a metaphor for everlasting love. Buying your girlfriend a diamond ring may give her a sense of being special and treasured. Con: Buying a diamond ring is costly, and putting a lot of financial pressure on the purchaser will not build the couple’s relationship. If buying a diamond causes a lot of financial restraints in your life, the Internet is available for you to research on other classy alternatives. If you’ve decided on buying a diamond engagement ring, studying the 4 C’s is as important as studying for a class exam. After all, you don’t want to waste your money on the wrong diamond. The 4 C’s stand for cut, carat, clarity and color. Cut. This refers to the angles and proportions of the stone, rather than to the shape of the diamond. A cutter determines a diamond’s cut, which gives the diamond its sparkle. Carat. The carat refers to the weight of the diamond. The heavier the stone, the more it will weigh on your budget. Clarity. Clarity determines the diamond’s perfection. The clearer it is, the fewer imperfections it has, and thus the more expensive it will be. Diamonds also have inclusions that affect their clarity. Fewer inclusions suggest better quality. Color. Diamonds have a variety of colors. Colorless diamonds are the rarest, and thus the most expensive, while white color diamonds are the most common. To determine the right color for your partner, check her style preference. Which metal should you choose for the engagement band? Choosing the right metal will enhance the overall design of your engagement ring. Platinum is the most durable, yet the most expensive, metal option. But you could go for a cheaper, yet similar look, by choosing a white gold. Rose gold and yellow gold are also stunning choices which are friendly to your budget. But always keep in mind your fiancé’s style before deciding on which metal to go with your gemstone. What are the warranty and return/exchange policies? Before you get overwhelmed by all the different cuts, styles, stones and metals for your perfect engagement ring, be sure to be a well-informed and wise buyer. Always check the jeweller’s warranty and return/exchange policies as accidents can happen. Finding the right engagement ring for your partner can exhaust you even before you propose to her. But the trip will surely be worth it, especially when she finally screams, “Yes, I will!! 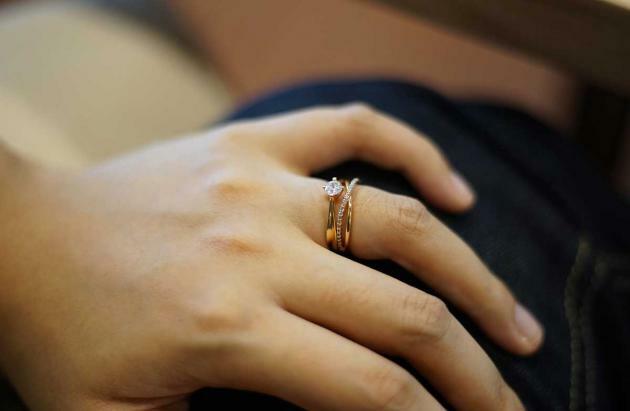 !” However, while this journey can be both exciting and scary, you should probably ask this last question first before you even think of buying an engagement ring: Have you really found the right girl?